The D-Link RangeBooster N™ 650 Desktop Adapter (DWA-547) is a draft 802.11n client device that delivers unrivaled wireless performance for your desktop computer. 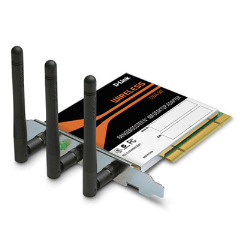 With this adapter, you can easily upgrade your desktop computer’s wireless connectivity. Once connected, access your network’s high-speed Internet connection while sharing photos, files, music, video, printers, and storage. Get a better Internet experience with a faster wireless connection so you can enjoy smooth digital phone calls, gaming, downloading, and video streaming. This product was added to our catalog on Tuesday 02 October, 2012. PeopleFu # 906SN (4mm) pack promotion.